We have some new hardware in our house, and it was put to good use. Our game day lunch was a big bowl of pho. We have pho almost every weekend. It's a household favorite, but I rarely make it myself. It's a lot of work for a bowl. In the past I've had to split it up into two pots to make as I did not have a pot large enough to make enough broth to make the work worth while. Armed with my new pot, I'm good to go. In the spans of preparing lunch, it rained, poured, hailed, thundered, poured and now it's sunny. Maybe a preamble to how the game will transpire? You will need a large stewing or soup pot. Place onions and ginger in a shallow baking pan, drizzle with a little oil, and broil in the oven for about 8-10 minutes flipping everything once until slightly charred. Add in the star anise, cloves, cinnamon, fennel and coriander and broil for 1 minute more. Sprinkle all bones, oxtail, shank with salt and pepper. Heat a large pan over medium high heat. Add 2 tablespoons oil. Brown the bones, oxtail, shank on all sides. Do this in batches so not to overcrowd the pan. Once you're finished, deglaze the pan with 2 cups of the water. 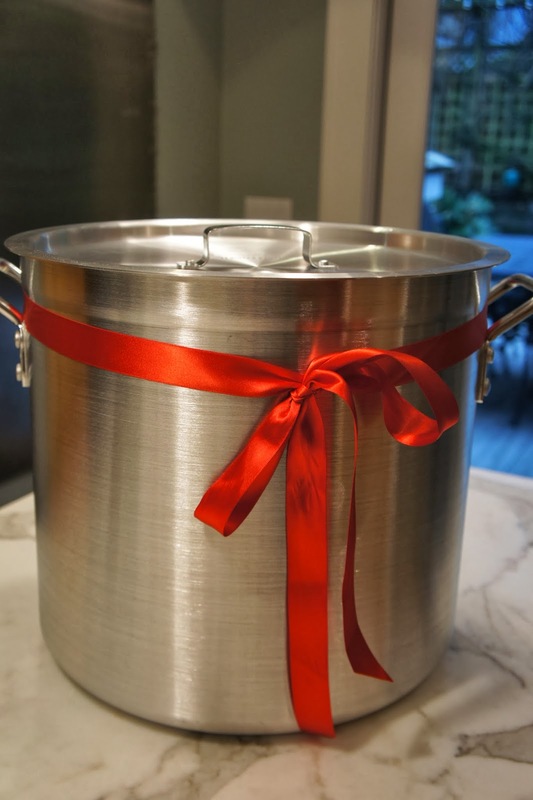 In a separate large pot, bring to boil the 9 ½ quarts of remaining water while you are browning the bones and meat. Add the browned bones, oxtail, shank to the boiling water, along with the onions, spices, fish sauce, thin soy sauce, wine and rock sugar. Turn heat to high and bring back to a boil. Once boiling, turn heat down to low, cover pot, and simmer broth covered for 7 hours. For easier handling, let broth cool a bit and then remove all the bones, oxtail, meat, etc. You can do this by removing the large meat and bones first and then use a fine mesh sieve to strain the soup to remove the rest of the solids. You can either discard all the meat, or find a second use. I've got a four legged family member who I know would love the shank meat. I separated the broth to freeze some for future meals. Store in the refrigerator overnight. Or, if you are making this for the same day just reheat the broth to a boil when you are ready to serve. I like the make it a day ahead method as it allows you to easily remove the fat that solidifies on top and I think chilling and reheating intensifies the flavors. Before serving the broth, test for seasoning, adding more salt as needed. Remember, once the noodles and beef combine with the broth, it will become less salty. Cook noodles according to package instructions. This will vary depending on fresh, dried and thickness. Place the noodles in a large bowl and ladle broth over top. Sprinkle with green onions and cilantro. If you choose a lean, thinly sliced meat, place the raw meet on top of the noodles before you ladle the broth on top. With the boiling broth, it will instantly cook the beef. For our short ribs, I dipped them for a few seconds into the same boiling water as the noodles before placing them into the bowl. Serve with a dish of basil, bean sprouts, sliced onions, lime wedges and some slices of jalapeno if you like. Go Hawks! It's almost game time.